Laggan is a small community in the heart of the Highlands of Scotland. It is surrounded by mountains, the Monadhliath Range, Cairngorms and Grampians. The community consists of a number of settlements the largest of which is Laggan Bridge on the River Spey. Other settlements include Strathmashie, Kinlochlaggan and Cat Lodge. Laggan is 52 miles from Inverness, 65 miles from Perth and 40 miles from Fort William. The nearest town and railway station is Newtonmore (8 Miles). The BBC TV series ‘Monarch of the Glen’ was filmed in the village and the surrounding area. Laggan has a vibrant and active community working to improve the social and economic well being of the community. The Laggan Forestry Trust, working in partnership with Forestry Enterprise has taken over the management of the forests which surround Laggan and is developing initiatives linked to the forest such as an interpretation centre and guided walks. In 1992 the Laggan Community Trading Company formed the Laggan Housing Committee to examine the feasibility of purchasing and renovating six houses at Strathmashie which had been put up for sale by the liquidators of the Strathmashie Estate. The Trading Company was aware that the maintenance of the population of Laggan was crucial to the survival of the local shop as well as the local school. The houses were withdrawn from the market before an offer could be made because of problems with the title deeds. However the initiative taken by the Trading Company led directly to the development of 6 houses at Laggan Bridge by Albyn Housing Society. Again in 1996 the houses along with the rest of the Strathmashie Estate were put on the market by Touche Ross. Laggan Housing Committee approached the Rural Housing Service to ask for help in putting together a new project to purchase and renovate the Strathmashie Houses. The community felt there was a continuing need for housing and further need would be generated by the Forestry Initiative. The Strathmashie houses were built in 1954 by the Forestry Commission for their workers. When the Forestry Commission scaled down its operations it sold the properties. Some were sold to sitting tenants, the others along with the rest of the Strathmashie Estate was sold as surplus to requirements in 1985 to a company owned by a Mr Herbage and registered in the Cayman Islands. During this period of ownership the cottages remained mostly empty – four remaining empty for almost twenty years. In the late 1980’s Mr Herbage went bankrupt and the houses and the Estate was put in the hands of Cork Gully, the liquidators. The liquidation was subsequently transferred to Touche Ross. The Rural Housing Service met with Laggan Housing Committee and Laggan Community Association to discuss how best to take forward an initiative to buy and renovate the properties. It was decided to approach Scottish Homes and Albyn Housing Society to find out if they would fund the project. Given their investment in the 6 new houses at Laggan Scottish Homes were reluctant to invest further funds so soon afterwards. Albyn Housing Society also expressed doubts about the viability of renovating the houses as they felt there could be substantial costs associated with upgrading the private water supply. Having hit a bit of a brick wall the community decided to investigate whether there were any other sources of funding for the project, The first thing they needed to find out however was how much money would be required to renovate the properties, and therefore how much they would need in total to buy and renovate the cottages. In December 1996 the Rural Housing Service and the community approached Mike Hamilton, the Housing Manager at the local Highland Council office in Kingussie for help to fund a survey of the properties and work out renovation costs. Mike was able to offer the community a small grant for a Feasibility Study. The study reported in February 1997 and estimated a total renovation cost of £138,000 for the cottages. It noted that the existing water supply was in urgent need of attention. This would cost a further £26,225 to upgrade. The total cost of buying and renovating the cottages was £273,000 (£135,000 purchase price and £138,000 renovation cost). The community with the Rural Housing Service investigated a number of options that would enable the Strathmashie cottages to be brought back into use. Almost too many options and none of which were straightforward. Discussions with Scottish Homes had made it clear that it was very unlikely that they could fund the project through Housing Association Grant. Two other grants available from Scottish Homes, Rural Empty Properties Grant and Rural Home Ownership Grant were investigated along with other grants and loans to see if a package of funding could be put together. A series of meetings was held with Highland Council, Scottish Homes, Badenoch & Strathspey Enterprise, the Community Land Unit at Highlands & Islands Enterprise and others to find a way of making the project work. The one option that seemed to offer the potential for realising the project was the Empty Homes initiative. This Government initiative was a challenge fund that invited bids from local authorities for funds to bring empty properties back into use. The initiative encouraged the development of partnership bids by local authorities and promoted the involvement of the community. The Highland Council brought together a Group involving representatives from housing interests across the Highlands to help develop their bid for the Empty Homes Initiative. The Rural Housing Service was invited to take part in the group. It was decided by the Group to include the Strathmashie Cottages as part of the Highland Council bid to the Empty Homes Initiative. A small group consisting of Laggan Community Trading Company, Highland Council, Rural Housing Service and Lochaber Housing Association developed the main funding elements for the project and the Strathmashie bid. The funding brought together for the bid included improvement grant funding from Highland Council, an Environmental Renewal Grant from Moray, Badenoch & Strathspey Enterprise and loan finance from a bank. These resources totalled £166,700. The total cost of purchase and renovation was estimated at £269,000- a funding shortfall of £102,300. The bid to the EHI was to meet this shortfall. In December 1997 the community heard that their bid to the Empty Homes Initiative had been successful. There remained one part of the funding jigsaw for Strathmashie that had to be put in place before the project could go ahead: the bank loan. The bank loan was a crucial part of the development and was to be repaid from the rental income generated by the houses. As such the amount of loan which could be raised depended on what the rents for the houses would be. All the partners and especially the community were determined to keep the rent for the houses the same as council rents (approx. £185 per month). It was therefore important that Laggan Community Trading Company was able to secure a good deal from a bank. It was decided to approach the Triodos Bank to see if they could provide loan funding at a preferential rate. The Triodos Bank is based in Bristol and is a bank that specialises in providing finance to community, environmental and social projects. Triodos were first approached in February 1998. They expressed an interest in becoming involved and worked with the community and the other partners to see the necessary steps completed to enable them to approve a loan. Laggan is the first loan venture for the Triodos Bank in Scotland. A crucial factor in securing the loan from Triodos was the agreement of a lease and management agreement between Laggan Community Trading Company and Highland Council. This was done through the existing successful Rural Leasing Scheme operated in Badenoch & Strathspey by Highland Council. Under this scheme the houses were let to Highland Council and then sub let by the council to applicants on their waiting list. The benefits to the Community trading Co. are a secure regular income from rent as well as a managing agent for the properties whilst for the council further houses were brought in to the pool of houses which could be let to local people. The security of the income from Highland Council to Laggan Community Trading Company through the leasing scheme was crucial to the award of the loan. With all the funding in place the real work of getting the houses improved and tenants in them could begin. 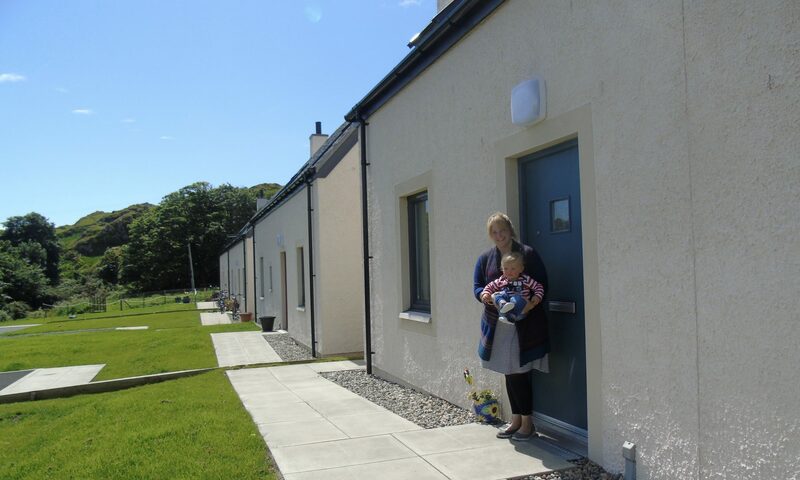 Laggan Community Trading Company approached Albyn Housing Society to ask if they would be willing to co-ordinate the renovation work for the cottages. Albyn agreed and throughtheir contact the community was able to secure a competitive price for the renovation from a contractor. The work on the houses started in November 1998 and despite a fairly poor winter was completed by March 2000. The cottages were officially opened by Calum MacDonald, Minster for Local Government & Housing on 26th March 1999. The cottages were all let over the summer by Highland Council from their waiting list.